Despite the large numbers of fast food restaurants, self serve department stores, and pump your own gas stations, Americans do appreciate good service. What’s more, they’re willing to pay for it. A prime example of how the American public is willing to spend extra money for better service is Federal Express, which has enjoyed immense success. For guaranteed out of town and/or out of state overnight delivery, its customers are willing to pay a premium that amounts to several thousand percent above the cost of mailing a letter or package. Interestingly, the majority of letters sent in the mail arrive within twenty four hours, but there are no guarantees. I think this tells us something about Americans appreciation for outstanding and dependable service. 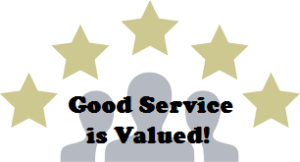 I know firsthand that people are willing to pay a premium for outstanding service. Again and again, I’ve been told, “Joe, I shopped around before coming to see you, and I’ve got you beat by a hundred bucks. But I’m going to buy from you because there’s one thing nobody else can give me, and that’s you Joe.” When I hear a comment of this nature, it’s the most flattering compliment I could receive. Repeat sales are so easy and require little effort in comparison to the first time these customers were sold. People are truly grateful for the extra effort I put into servicing them, and they don’t forget it when the time comes to buy another car. The truth is they’re sold before they even walk in to see me because I’ve won them over by giving outstanding service the first time around. I’ve read in a recent survey that in spite of some service oriented companies charging nearly ten percent more for their goods, their market share increased by six percentage points annually. Compare this to those companies not providing outstanding service (they lost two percentage points annually). I interpret this to mean that good service will always be appreciated by customers. Furthermore, those salespeople who give it will always outperform those who don’t. Unfortunately, people don’t expect it, and they’re surprised when they get it. That’s too bad. It should be the other way around. The name of the game is service. Give your customers so much service they’ll feel guilty even thinking about doing business with somebody else. I’ve always believed that the first car I’d sell to somebody was the beginning of a long relationship. To be successful in any business, it’s essential to give the customer so much service that he or she will come back again and again. When you consider how many cars a satisfied customer buys during his or her lifetime, the first one is just the tip of the iceberg. I estimate that over an average car buyer’s lifetime, he or she spends several hundred thousand dollars buying cars. And when I project how many friends and family members are referred by a contented customer over the years, the number runs into seven figures. Winning lifetime ever lasting relationships isn’t based on a single mammoth act. You build ever-lasting relationships by never letting up on the servicing of your customers.